Alpha Books would like to offer your blog a complimentary copy of You Can Do a Graphic Novel for a book giveaway promotion for your readers. Barbara Slate has done it all. Her first character, Ms. Liz, appeared on millions of greeting cards, in a regular comic strip for Cosmopolitan magazine, as a spokesperson for Dupont’s Lycra and as the star in a series of animated segments on NBC’s Today Show. Her big break in comics came when she created Angel Love for DC Comics. From there, she created, wrote and drew Yuppies from Hell, and Sweet XVI for Marvel and put her own spin on the Disney classics Beauty and the Beast, Pocahontas, Archie’s Betty and Veronica, and Mattel’s Barbie. Barbara’s art has been exhibited in many galleries and reviewed by The New York Times. She is profiled in the seminal work A Century of Women Cartoonists. Stan Lee, Chairman, POW! Entertainment and Chairman Emeritus, Marvel Entertainment, calls Barbara “titanically talented.” She is currently busy being a mom, doing a graphic novel titled, I Got Married and Other Mistakes, and teaching. Her website is barbaraslate.com. My Take on the BookI have been amazed to find that graphic novels are becoming more and more popular with young adults today. It reminds me a lot of how popular comics were when I was a child. Now though these graphic novels are taking the place of some novels in the literature of choice of the younger generation. 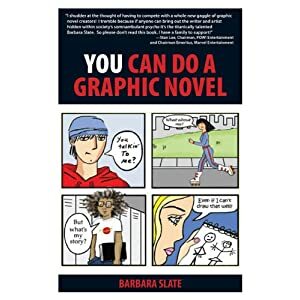 With this in mind, this book did a great job at opening the door to any aspiring artist to be able to realize their dream if writing their own graphic novel. The most poignant part of the book, in my opinion, is the amazing background and experiences that the author brings to her readers. As the author has been a successful comic book artist and graphic novel artist/author, she uses her experiences to truly show future artists with ideas and perspectives about what they need to do to make good choices about their art and their future career. The author is quite motivational and she makes it seem like anyone can do this. She covers all of the basics in this and she has written this book with the young adult in mind. Filled with manageable chapters, lots of colors and fonts, the author uses tons of variety which allows the young reader to stay engaged. This was a great book that I would highly recommend to others!Who knows, you might be the next artistic author to come on the scene! The Adventures Of Tintin Coming To DVD! What can you buy with a tank of gas? Gnomeo & Juliet on DVD & Blu-ray Tomorrow! Book Review - 9-11. . .NYC. . .The Day After. . .
Book Review - What's Eating Your Child? Amazing New Charlie & Lola Products Great! WINNIE THE POOH: Mother's Day Card! Smart Mouth is Mouthwash that Lasts all Day!